We’re back on Palm Bay for this post but with a situation that seems to affect all elections and races these days: signs. Even we get tired of the electioneering signs for various candidates. They seem to be everywhere and as the election draws near, you’ll see more signs. 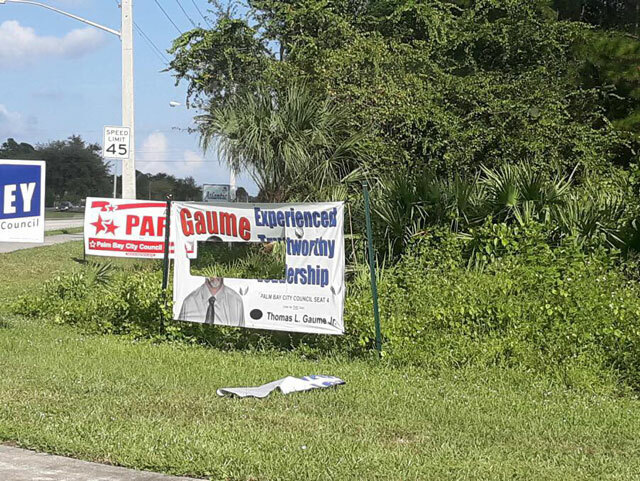 Far above and beyond this are the signs of Thomas Gaume who is running against Kenny Johnson Jr.
Gaume posted an image of one of his larger signs on private property at the corner of Malabar and Eldron that was attacked and basically destroyed. Someone decided to rip Gaume’s sign up. The irony here is that Gaume has a supporter or two that is, shall we say, “a little rough around the edges.” On social media, these folks get into with others using tactics that we would not use and that Gaume himself has said do not reflect him or his values. People that supported Calvin “Tres” Holton and those who support Kenny Johnson have said that the words used by some of Gaume’s supporters reflect on Gaume as a candidate. With voters having kicked Holton to the curb, either Holton supporters are still mad at Gaume for getting more votes than Holton, or Johnson supporters are destroying Gaume’s signs. If non-supporters of Gaume claim Gaume is responsible for the words of his supporters, doesn’t that mean that Johnson is responsible for the violent and illegal actions of his supporters? Does Kenny Johnson believe that attacks on private property are allowable because you disagree with a person? Does Johnson think that people don’t have the right to voice their support for a candidate? When people started to attack Gaume through the actions of his supporters, Gaume got out in front of the issue and said what he thought. As of this writing, despite the Johnson camp being aware of the destruction of Gaume’s signs, their response has been the melodic sound of crickets chirping. But this? This destruction of private property on another person’s property is way beyond the pale. It is wrong morally, ethically and legally. 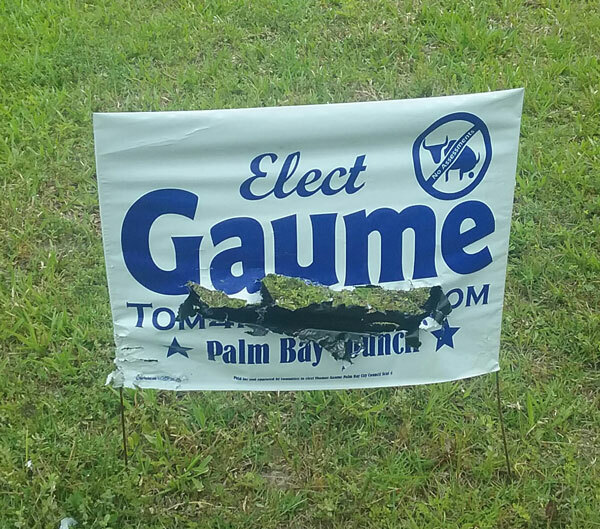 We just find it amazing that people have attacked Gaume for the words of his supporters, and yet are perfectly fine with supporters of their candidate breaking the law and destroying property. We won’t go as far as to hold Johnson responsible for the actions of some, but we will hold him accountable for not condemning those who are violent and destroy property. If Johnson cannot take a principled stance on this seemingly easy issue, how will that translate to him sitting on the City Council where issues are not as clear? Also crickets from Florida Today. Apparently they only publish the so-called “racial slur” when someone spray painted the name of a country on the opponent’s sign. Florida Today ignoring the Gaume sign vandalism so far. The other explanation is that the moving of signs and destruction of electioneering signs has become so commonplace that is it not news anymore. It is horribly disheartening that there are people out there that are so filled with hate against another candidate and other people exercising they First Amendment rights as to destroy private property. Mr. Teresi…. I agree. This is typical of both the paper and TV media-“If it bleeds, it leads”. Racial slurs sell newspapers, damaged property does not. I have received in the mail some rather nasty campaign propaganda; my response is simple. Regardless of the political affiliation of the candidate, I will not vote for anyone who stoops to character assassination or property damage in his/her campaign. And I too anxiously await Mr. Johnson’s response. What a joke. Yea thats the ONLY possibilities right? Its either Tres voters or Kenny voters. Maybe, juuuust maybe its Tom voters who are obviously desperate to get some kind of, any kind of, support for his non-supported candidate. That’s the most obvious self sabotaging sign destruction I’ve ever seen. Word on the street is there’s an actual video of this happening. Hmmm wonder when that will surface? And how do you know the Kenny camp didnt respond? Did you ask them? I doubt it. Im curious, where’s the article you wrote about Kenny’s sign? Whenever we get a comment like yours, we like to fisk it, point by point so that there is no confusion. Its either Tres voters or Kenny voters. Maybe, juuuust maybe its Tom voters who are obviously desperate to get some kind of, any kind of, support for his non-supported candidate. That would be the “non-supported candidate” that helped kicked Calvin “Tres” Holton to the curb by the “non-supported candidate” getting more votes than Holton? That’s the most obvious self sabotaging sign destruction I’ve ever seen. We wonder how one becomes a self proclaimed “expert” on “sign destruction?” Experience perhaps? And how do you know the Kenny camp didnt respond? Because as of the writing of the post, they had not. Oh that’s right. You only wrote to make sure people knew he wasnt a black candidate. It really would help if you actually read what was written as opposed to what you think must have been said. Whoever did this is a vile human being and deserving of every ounce of scorn that can be heaped upon their brainless heads. However, in some ways, who did this despicable act doesn’t matter. What matters is how you, we and us react to this. We can condemn it as we should, but whoever did it is relying on the idea that Kenny Johnson is a black candidate running for office. That’s a pretty strong condemnation if you ask us. And yes, we spent time in the post saying that Johnson should not be viewed as simply a “black candidate” anymore than Gaume and Holton should be viewed as “white candidates.” To do so bring races into the equation which appears to be what you want. We cannot fathom why anyone would vote for or against someone because of their race. You may feel differently. As the article was written before the primary, we went on to say that what matters in a candidate is what they bring to the table and how best they can serve the people of Palm Bay. We acknowledge that Johnson’s experiences as a black man may be different than white Holton and Gaume, but unlike Holton and Gaume, Johnson never served in the military which installs a certain set of values into people. Does military service matter? That’s up to the voters and we take no position on that. However our point succeeds and your point fails is that we argue for people to stop viewing people by race. To do so is prejudicial and as a society, we should be moving forward away from that. If not, why not? If so, why should our condemnation of the attack on the sign of Johnson and a statement that we should vote on people’s character and what the bring the table contrary to that ideal? PS – we notice that you didn’t even bother to condemn the destruction of the signs, Danny. Can you explain why you seem to believe that the destruction of the signs is acceptable? I’d love to see the video if anyone has it. On second thought, son’t send it to me just turn it over to the police. I did file a police report with PBPD and will pursue charges if the perpetrator is caught. I will have to disagree here. I believe the actions of supporters is somewhat a reflection of their candidates opinions and actions, While it may be true you cannot control what they say, after awhile you can tell them publicly ( to be nice here) take a hike if they do not listen to you privately. Because no matter how you slice it becomes a reflection of your campaign. It isn’t an easy situation, that is for sure. While we agree in principle, we wonder how to “publicly come out forcibly” works in practice. If you remember, Trump and Bush were supported by white supremacist David Duke. Trump and Bush both came out condemning Duke and what he stands for and repeated the condemnations several times. It was never enough. The press, groups and their opponents constantly made an issue of it. The second thing would be, does the candidate have to “publicly come out forcibly” each and every time some supporter does or says something stupid? (Especially if it is the same supporter?) After awhile, it would seem that the candidate is responding more to the words and actions of those he cannot control rather than to the words and actions of his opponent as well as trying to get his message out. We are strong believers in letting idiots and morons expose themselves through their words and actions rather than trying to shut them down. There’s a reason roaches don’t like the light, if you get our drift. However, as we said, your point is well taken. We just aren’t sure that the devil is in the details of making it work. I am reminded the quote I believe it goes ^ In the end will we remember the words of our enemies or the silence of our friends” . As we said, we would hope that the destruction and moving of signs, as well as the despicable racial slur written on another sign is something that we all can come together and agree is wrong. Whether it is a case of opponents doing it or even candidates doing as a sort of “false flag” type thing, it is still wrong. To us, in a politically divided climate, we would see this as a case were we can all come together instead of being divisive. This foolish destruction of signs is about as juvenile as keying a car for retribution. What is the deeper issue, the level of the cabal feeling they are losing their corruption! Where is the examination of the City Manager? The huge loss of staff since his hiring, and the nepotism that took over with the cabal? Johnson is too busy to respond to inquiries because he’s making fun of, in blasphemy, of City Hall with “Pee-Wee and Carlton” dancing?